Yesterday was my first official day off this Christmas, so I was finally able to catch up on some baking and decorating to ready our house for a whirlwind of Christmas parties to come. Pictures below: I call this our "final" state of our 2017 Christmas decoration. 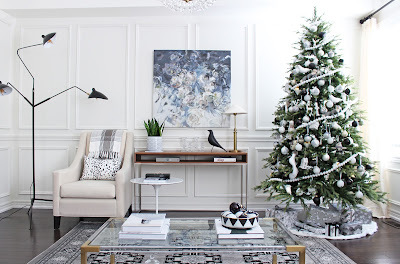 You can read about our Christmas home tour part one here. The first up was to decorate this year's gingerbread house. Before this week, I had this ambitious plan to bake my own gingerbread cookies and build the house from scratch. With Christmas only a few days away and a ton of stuff still needed to be done, I went with the Ikea gingerbread house kit to give myself a head start. The Ikea kit is a no-frills set which was perfect for me. I always made my own royal icing anyways. So here's my 2017 gingerbread house based on the Ikea VINTERSAGA set. Anthony immediately pointed out that the charcoal navy front door looked just like the door paint colour we had at our cottage. Mission accomplished! The wreath on the side of the house was a nice touch. It was a royal pain to pipe a very thick tube of icing vertically, but I liked how it turned out. I never thought I was a Buffalo Check person until I spotted these cute stockings by President's Choice. I know, it's totally uncool to buy decor accessories from a grocery store. But, I will make an exception for PC Home. They actually carry pretty stylish stuff. 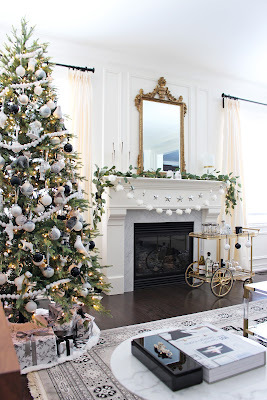 Look at those tiny brass bells on the stockings...how cute are they?! The black deer head stocking holders are also from this year's Christmas collection, and I got them at 50% off! Remember that Serge Mouille ceiling light I have in my cottage dining room? I am so obsessed with it that I ended up getting a floor lamp for our home. This tall and handsome fella arrived just in time for holidays. I was having a few very hectic weeks at work leading up to the holidays. I was frustrated and exhausted, and didn't think I would have any energy left to pull off the upcoming festivities. Then yesterday my bestie dropped off this super gorgeous white and burgundy Freesia bouquet for me, gave me a hug and told me I had the energy level of a 10-year old. And all of sudden, all the exhaustion was lifted away from me, and I felt like an Energizer bunny again. I am so grateful to have friends that would quietly listen to my ranting, and do just the right thing for me to keep me back on track. Wish you and your loved ones a very Merry Christmas!